I'm normally at pains to emphasise that your gardening for wildlife must be targeted on those species that are likely to visit your garden. This may seem like the most obvious thing ever, but there are books out there that seem to indicate that if you only do 'x' then 'y' will come. "Plant Buckthorn or Alder Buckthorn and you'll get Brimstone butterflies". Not if you live north of Yorkshire you won't. "Put up nestboxes and you'll get Tree Sparrows". Well, the nearest Tree Sparrow colony to me is over 30 miles away; for many of you, it will be even more than that. And another piece of advice you sometimes see is, "Plant violets to attract fritillary butterflies." Now part of the advice is true - in the UK, we have several species of fritillaries, and the caterpillars of Small Pearl-bordered, Pearl-bordered, High Brown, Dark Green and Silver-washed (below) all feed on the leaves of violets. And yet these are butterflies that live in colonies. One violet here or there isn't enough - the violets need to be widespread in woodland clearings or flower-rich grasslands or coastal cliffs, depending on the species of fritillary. So it means that, unless you live near to one of these habitats, you are very unlikely to be visited, let alone be able to help these species. But only last week, one of my RSPB colleagues had a Silver-washed Fritillary pass through her garden and pause on her Buddleia. Her garden is 2km, as the butterfly flies, away from the nearest colony, showing how individual butterflies can wander. While I'd never advise her to start planting violets thinking that they will breed, the fact that she has nectar-rich plants that butterflies will enjoy is perfect, because not only will her resident butterflies benefit, but rare waifs and strays such as her Silver-washed may get a useful energy boost on its journey to its real home. 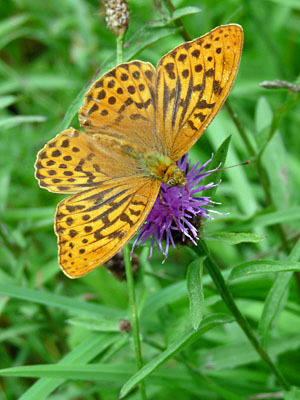 And that all gives me the excuse to show more Silver-washed Fritillaries photos that I took this weekend, in a wonderful wild woodland, nectaring on a real butterfly flower of choice - Common Knapweed. Note the Red-tailed Bumblebee nectaring too. And the Knapweed in the woodland also had Green-veined Whites (below), hoverflies and Common Carder Bees too, which I do get in my garden. 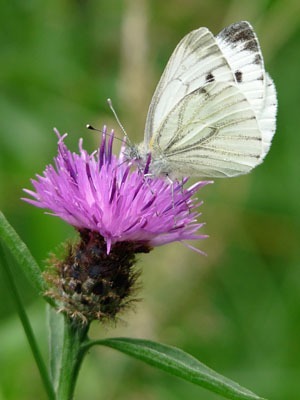 And that's why I grow Common Knapweed, not for Silver-washed Fritillaries, but for those insects I know are in my garden and I know will benefit. 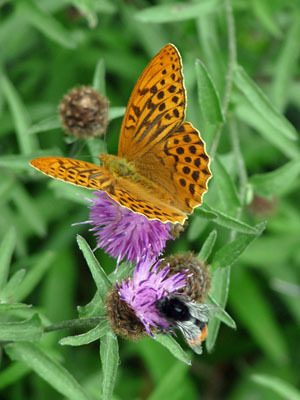 And if a Silver-washed Fritillary ever visits, it is more than welcome to have a drink on its way through!